Ivory. 7th century BCE. Rome, Capitoline Museums, Museum Montemartini (Centrale Montemartini)Inv. No. AntCom27876. 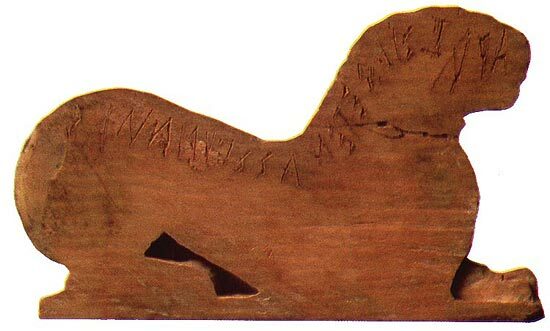 Lion with an Etruscan inscription, scratched on its back. Rome, Forum Boarium — S. Omobono (1970). © Photo, text: GIOVANNI D’ANNA “LEGGENDE E TRADIZIONI DELL’ANTICA ROMA”, ARCHEO, N. 31, p. 39.